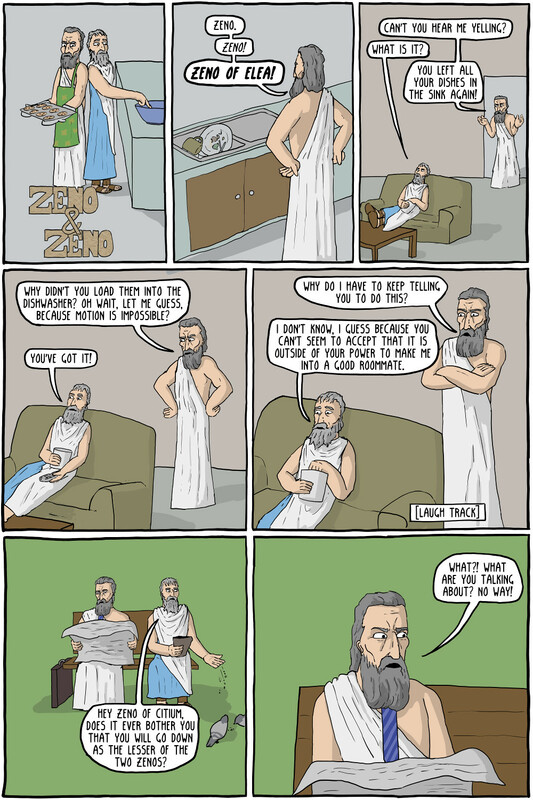 Later on Zeno of Citium, in accordance with Universal Reason, ate all of Zeno of Elea's leftovers, because Zeno of Elea doesn't deserve them after the mess he left. I mean come on. 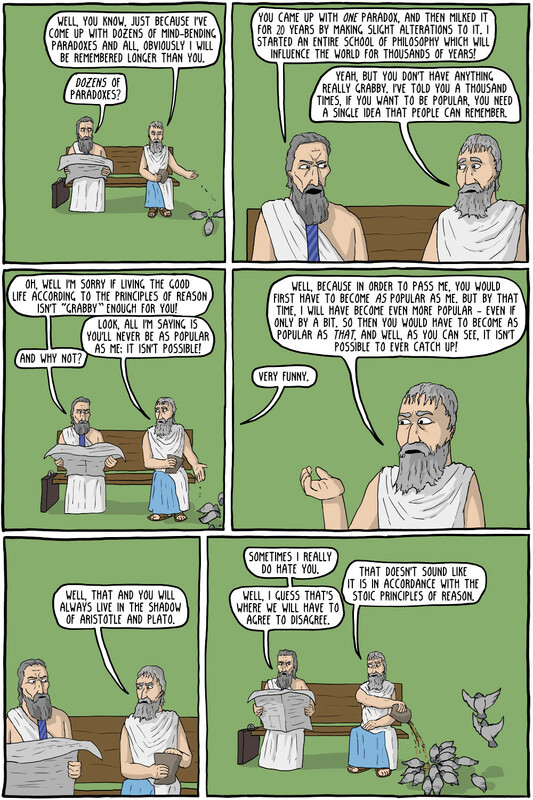 Zeno of Citium was founder of the Stoic school of philosophy. He believed happiness and the good life consists only of aligning yourself with the Universal Reason, and being virtuous. Even negative emotions were under your control, and so feeling negative emotions was immoral, and unvirtuous. If something bad happens to you, the Stoics believe it isn't the event that causes unhappiness, but your reaction to it. So a man in perfect stoic virtue will never feel any unhappiness whatsoever. He will accept any hardship, since reason dictates that there is no use getting upset over things outside his control. Zeno of Elea was a philosopher best known for Zeno's Paradoxes, in particular the Paradox of the arrow, which says that since an arrow would have to first travel halfway to its destination before arriving, and then halfway again, and again, and so forth - that it would never arrive. The paradox of Achilles and the Tortoise is a variation, which says that Archilles could never catch up to a tortoise in a race since by the time he got to where the tortoise was, the tortoise would have moved a little, so he would have to get to that new spot. But of course by the time he got to that spot, the tortoise would have moved a little again, etc.